What’s the Secret Behind the Ford Ranger Raptor’s P 300,000 Shock Absorbers? The biggest ace up the Ranger Raptor’s sleeve is its Fox shock absorber system. It’s the one responsible for giving this pick-up truck the ability to drive over rough roads at very high speeds (think 160 km/h) and yet give it on-road comfort and stability that beats everything else in its class. It’s also pretty expensive: a set, according to the Ranger Raptor’s Chief Program Engineer Damien Ross will set you back half the price of the Ranger’s bi-turbo diesel engine. Ballpark figures say it’s about P 300,000 and that’s a pretty hefty sum, but it’s also what makes the whole pick-up truck worth it (don’t worry, Ford says they’re designed to last the life of the truck). Ford isn’t the first carmaker to run Fox shocks as a factory upgrade. Jeep and Toyota both use them as factory options (or as part of their accessories catalogue), but there’s something that makes the one found in the Ford Performance Raptor family unique. Jointly developed by Ford and Fox, the 2.5-inch Fox shock absorber in the Ranger Raptor is the same size as the first-generation F-150 Raptor’s but shares technology found in the contemporary F-150 Raptor’s 3.0-inch version. Before tackling what’s underneath the Ranger Raptor, it’s worth noting first how shock absorbers work. In a gist: they’re basically a tube of thick fluid that pushes against bumps. The secret though is how to control the flow and temperature of this fluid. A standard shock absorber, found in a Ranger Wildtrak for example, will have basic pressure regulation. Changing that to some off-road centric shocks may give it added ability on the trail but may become too floppy on the street. What makes the Ranger Raptor’s shock absorbers different is that they are stepped in a way that it changes the damping depending on several factors. There are more valves inside that regulate fluid flow (damping) more precisely. This equates to a more pliant ride in rough conditions, but more importantly, it also lets it be comfortable in a bigger range of conditions. In fact, the last part of the shock absorber’s compression—called “final zones” act like a hydraulic bump stops that send fluid through the top of the piston preventing it from bottoming out. Aside from being comfortable both on- and off-road, the Ranger Raptor’s trick suspension system also gives it up to 30 percent more suspension travel compared to the standard Ranger (236 millimeters front and 290 millimeters back). Couple that with a class-leading ground clearance of 283 millimeters and generous approach (32.5 degrees), breakover (24.0 degrees), and departure (24.0 degrees) angles, and you’ve got a pick-up truck that’s ready for all sorts of adrenaline-filled adventure. Now, the question in everyone’s mind is this: can it do repeated jumps over dunes and stuff? Well, sure it can, but it’s not advisable. The Ranger Raptor is cool, but its limits have to be appreciated as well. While Ford calls it “the most capable factory shock absorber ever on a pickup truck,” it pales in comparison to a real Baja (aka trophy truck) racer. Let’s put this in numbers: the Ranger Raptor will have up to 290 millimeters or 11.5 inches of suspension travel and that’s a lot (it’s actually just 2 inches shy of the F-150 Raptor), but compare that to anywhere between 30-40 inches (762 millimeters to 1,016 millimeters) in a typical Baja truck and that cool pickup of yours is just outclassed. In short, the Ford Ranger Raptor will undoubtedly be unbeatable off the showroom floor be it on the sand, trail, or where ever else it can fit in. But just be warned: just don’t drive it from the parking lot to a starting line. If it can perform near F-150 Raptor then it will be very good indeed. F-150 diagonal test showing suspension travel in 2WD https://www.youtube.com/watch?v=_Lt-SmCpAnw although F-150 Raptor has 13.9" suspension travel vs 11.5" on Ranger Raptor. 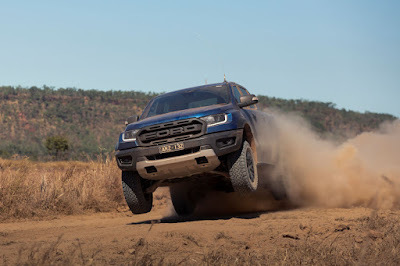 Sir Uly, Is the Ranger Raptor capable of going through flood as the standard Ranger Wildtrak? The Ranger Raptor has a 850mm wading depth, so most probably yes. I don't think its worth 300K sir, in US mostly of the real raptors change their shox for more play and reliability although FOX is a good brand, no doubt about it.. its just marketing strategy to increase its value.. its just an ordinary shox w/ reservoir.. just my 2 cents. They're putting too much hype for this. I don't think it will be priced competitively at all. For those hoping to get one, there's a huge chance it won't be your sub-2M pick up. It definitely won't be below P 2M. Good news its going to be cheaper here.. Same pricing more or less in Australia. I'm guessing we'll get it at P 2.595M because they want to create a pricing gap to the Mustang EcoBoost.